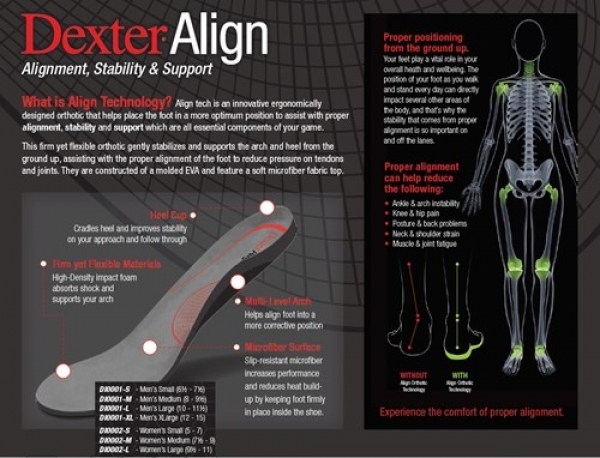 These new Dexter Align insoles are sure to add comfort and stability to your game! The insoles are made of high-impact foam that provides a firm yet flexible support. These replacement orthotic footbeds help place the foot in a more optimum position to assist with proper a more optimum position to assist with more proper alignment, stability, & support. These soles are great for keeping any bowler smart on their feet! For both regular and wide width shoes.